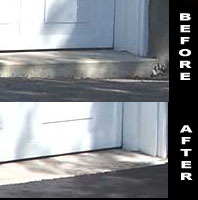 The gap between the concrete floor and asphalt driveway opens up, leaving a gap accessible to water and rain. Water seeps into the gaps during summer, causing the driveway stone base to dissipate resulting in the sinking of the driveway, eventually sloping towards the foundation. This causes more water to drain into the foundation area. When it gets cold water draining underneath freezes causing ice to expand and causes asphalt to heave and buckle. Water freezing under the concrete floor during winter will expand and your concrete floor will crack. A concrete floor cannot be properly repaired without replacement. This is very costly compared to the low cost of putting in a garage lip.